For an iconic run along a long stretch of beach, look no further than Arroyo Burro Beach County Park — more commonly known as Hendry’s Beach. Go at low tide for optimum sand conditions, and take note: you might want to start the first section of beach shoe-free — a river flowing into the ocean here can sometimes be deep, depending on tides and rains. 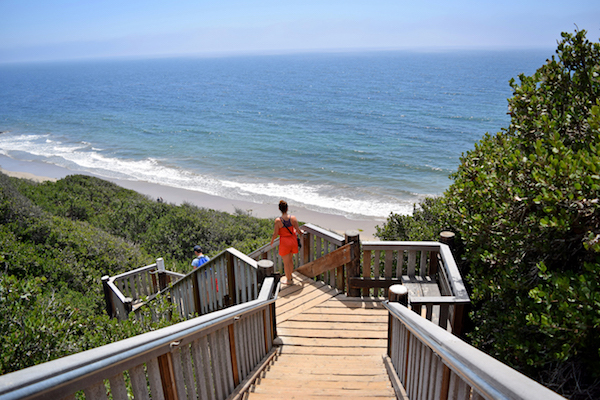 After almost a mile of beach running, you’ll be rewarded with this loop’s signature obstacle: a steep staircase climbing the dunes to Mesa Lane. After a brief stint on paved roads, this run returns via the well-kept paths of Douglas Family Preserve. Note: How much you can run on the beach is tidal dependent.